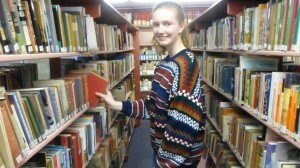 Eleanor was presented the Yvonne Zola Encouragement Award at Orange CIty Library. 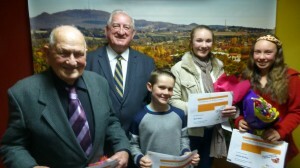 ABC Radio Central West hosted an awards ceremony for local winners of the Banjo Paterson Writing Awards. Orange Mayor Cr John Davis presented short story 3rd prize winner Neville Smith with his prize for the amusing short story The Accountant. Mitchell was presented first prize including a commemorative Banjo Paterson coin for his poem A refugee lost in the sea. Jemima won second prize for her poem Dusk and Mary was presented 3rd prize for her short story The Locket. The Yvonne Zola Encouragement Award for an Orange-based writer was presented to Eleanor for her poem Letters Home at the Library prior to the school holidays. Congratulations to all the winners and those who entered the awards. And a BIG thank you to the judges and supporters The Central Western Daily, ABC Central West Radio and the community.